are in the process of digitizing their records? More about this later in this post. The theme of this post is two-fold. First, I want to reiterate once more that a genealogist never knows where precious information may come from. No matter how distant, we should never overlook any possible source. And second, two heads collaborating on a research question are so much better than one. In my blog post of September 19, 2011, I wrote about the pleasures of working with another person to tackle genealogical research. 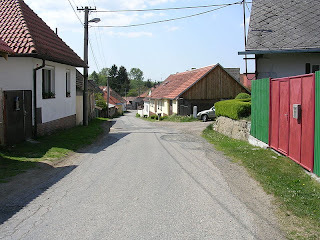 I have been very fortunate to be partnering with my sister, Monique Whitman, to ferret out the details of our Czechoslovakian Holub ancestors’ lives. It’s amazing how much more two can unearth than one! Monique asked our mother’s advice on whom she might contact in order to find out more information on our maternal grandfather, Frank (Frantisek in Czech) Holub. Well, our mother recalled that Frank had remarried when she was about twelve. Monique did some serious sleuthing and found that Frank’s second wife was Angeline (Ann) Oslakovic Holub, they married in 1939, and the marriage lasted the rest of Frank’s life. 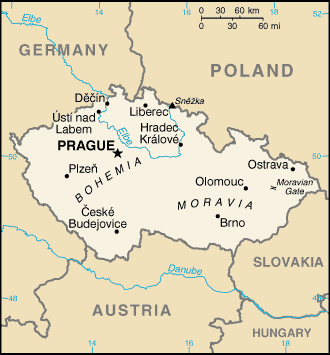 (upper left - ) Czechoslovakia, district Benesov, county Vlasim, town born Naceradec no. 139. Father Josef (Joseph) Holub, born at Volesne, Benesov, a cottager at Naceradci no. 139, legitimate son of Jan (John,Johann) Holub, worker at Volesne and Antonie (Antonia) born Zemanove (Zeman) at Dolni Lhoty (Lhota), Ledec. Mother Marie, born at Prague, book 2, page 441, illegitimate daughter of Marie Lojinove, legitimate daughter of Vaclav (Wenceslaus,Wenzl) Lojina, worker at Bukove, Pribram and Barbora (Barbara) born Krasu (or Krasn) at Rosovic, Pribram. Priest - Antonin Filip, priest at Naceradci. Godparents Frantisek Hausner, shoemaker at Horni Lhota no. 7 and Barbora, wife of Antonin Kroupa, farmer at Lhota 4. Midwife - Terezie Doubkova, examined (like licensed) at Naceradci no. __. 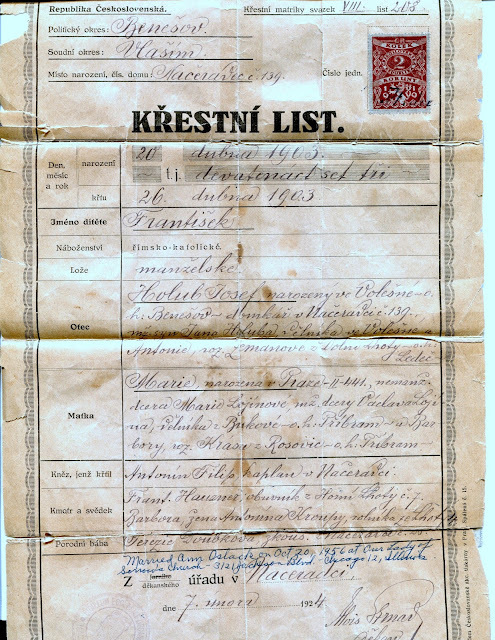 From this document, we finally found out the name of Frank’s mother – Marie Lojinove born in Prague. Oh, what joy! None of the American records that Monique and I had found mentioned Frank’s mother. 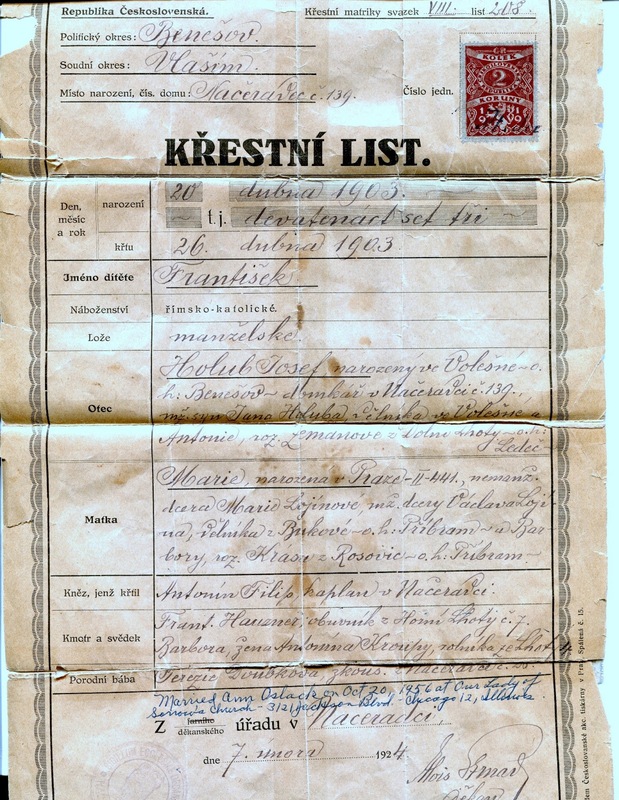 We also saw that our identification of Frank’s father as Josef (Joseph) Holub living in Naceradec was corroborated by this record. In addition to translating the baptism record, Judy alerted me to the fact that the Czech Regional Archives are digitizing their records. Now Monique and I can search for the records of Frank Holub’s parents and grandparents and even further back. Teamwork pays off in many ways in life, but in genealogy the rewards can be amazing. If you want to move forward in your research, it is to your advantage to find others with similar interests. Joining genealogical societies, like the Czechoslovak Genealogical Society International, is one way to find communities of people to work with. And looking closer to home, you might find siblings and cousins who are eager to join you in unlocking family history.